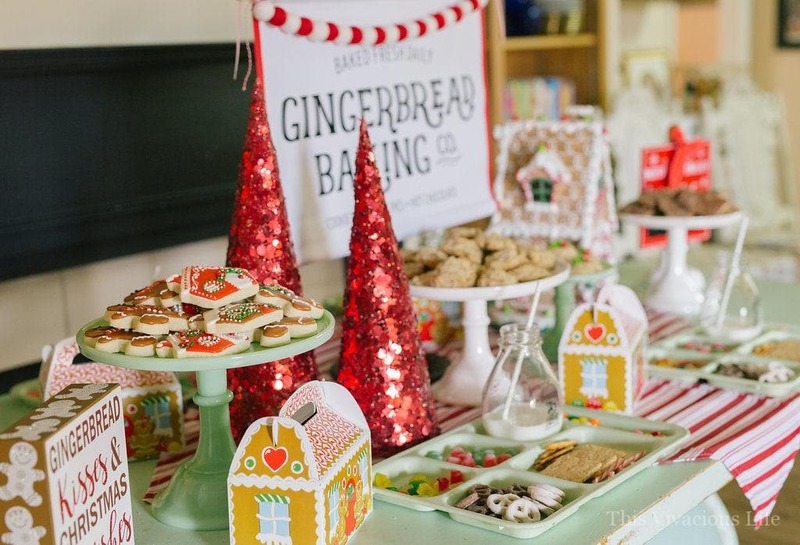 This gingerbread decorating party is sure to give all your guests more holiday spirit. 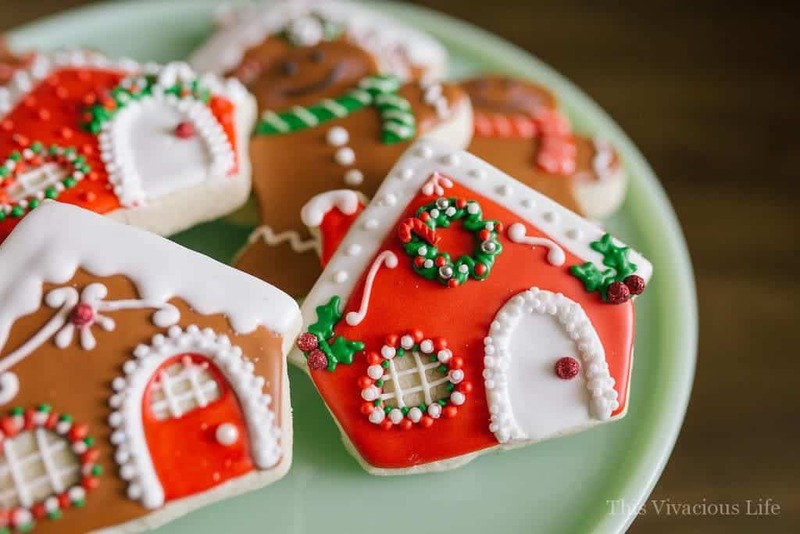 It is full of fun and easy ideas to make your own gingerbread houses and so much more! 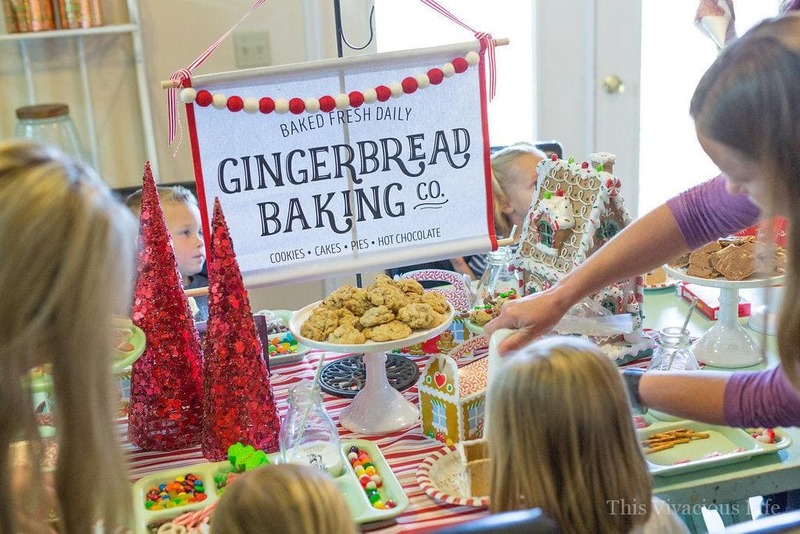 Whether for the kids or a girls night out, this gingerbread decorating party is full of holiday fun for everyone. 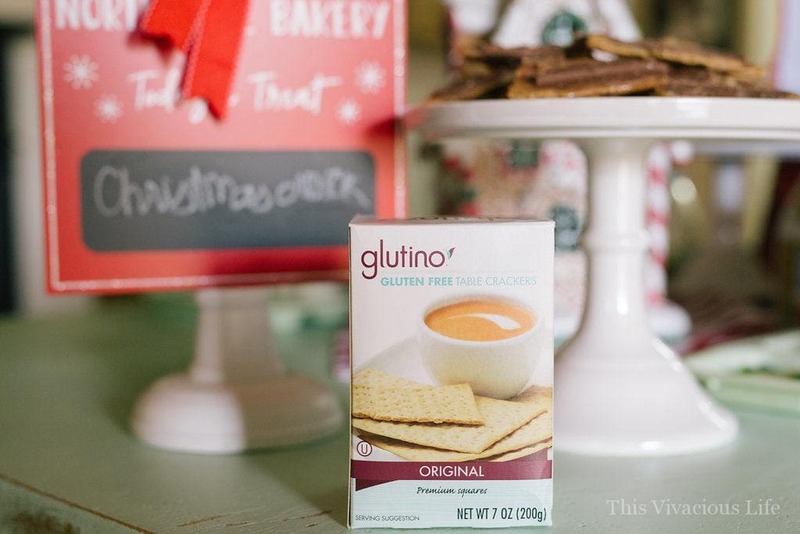 We are SO excited to kick off our annual 25 Days of Giveaways with this gingerbread decorating party featuring one of our favorite brands, Glutino. PLUS, we get to giveaway this incredible $300+ prize that includes Le Creuset! Come back each day through the 25th of December for a new and exciting giveaway and brand feature. This is our most anticipated event each year and we are so excited to have you a part of it. 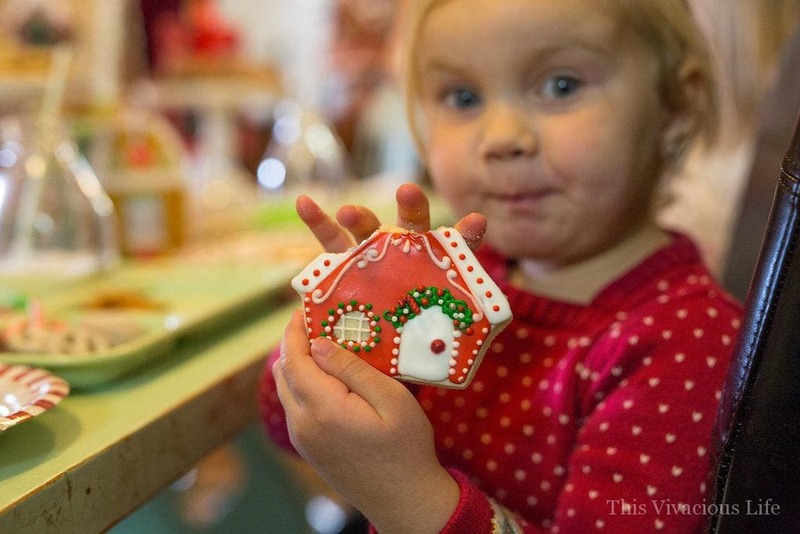 This gingerbread decorating party ended up being the perfect birthday party for our little lady. 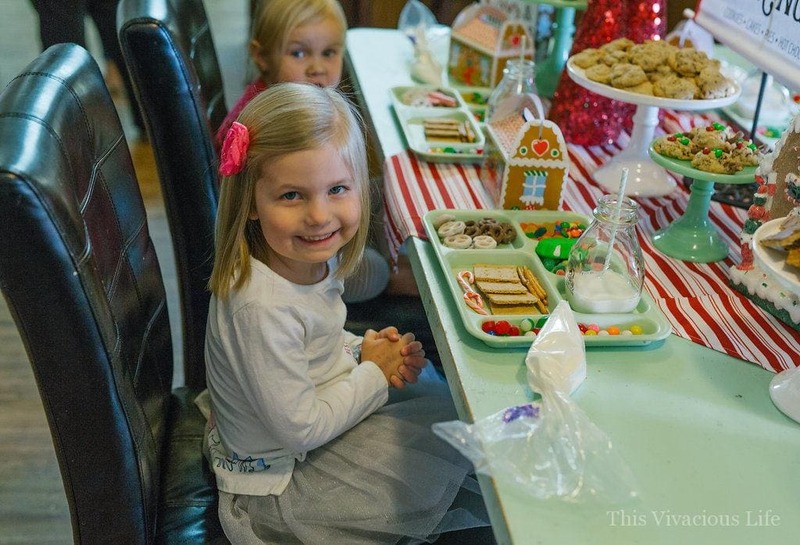 She loved having her friends over and building gingerbread houses with them. 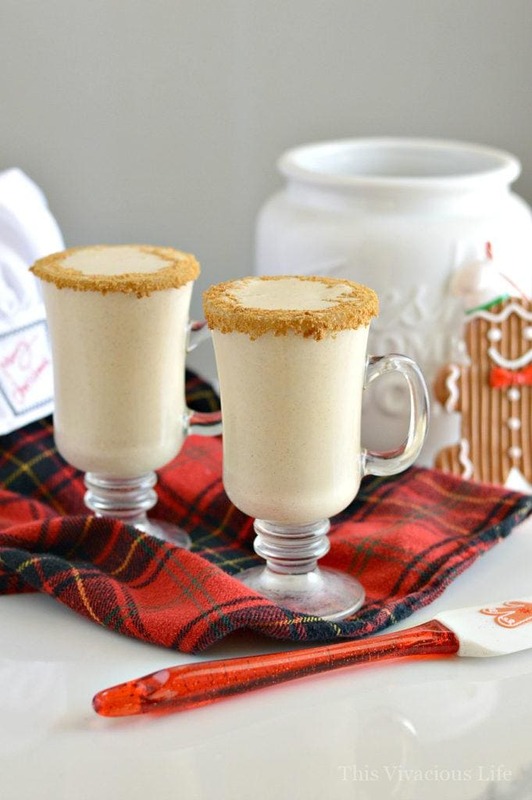 Everything was themed for the holidays and was surprisingly easy to bring together in a whimsically fun way. The kids had a blast! You guys know I love a beautiful themed sugar cookies at any party I host. So I figured we couldn’t go wrong with these gingerbread boys and houses. My friend Shanan over at Enchanted Cookie Boutique couldn’t have created my vision more beautifully. When everyone walked in, I also wanted it to be very clear what the theme was. 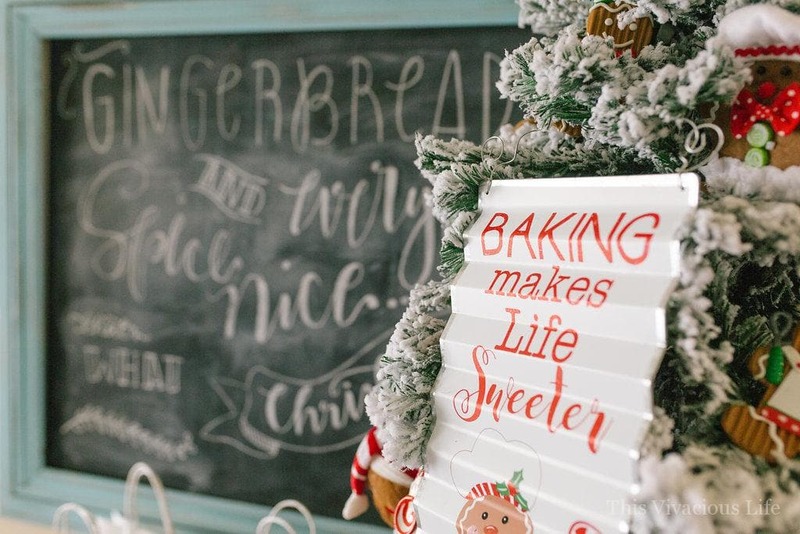 I had a big chalkboard sign that said, gingerbread spice and everything nice that’s what Christmas is made of. 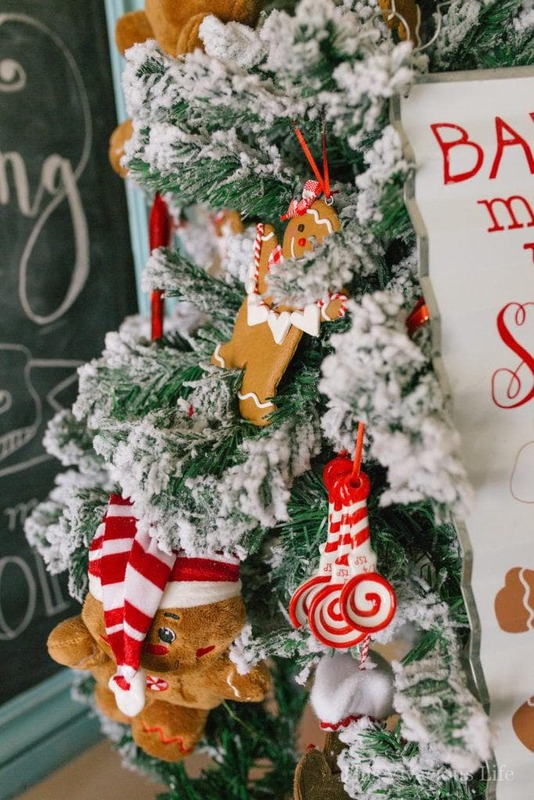 Next to the chalkboard sign was a mini 4 foot flocked Christmas tree adorned with gingerbread ornaments and signs. The plush gingerbread men even smelled like gingerbread which the kids love. 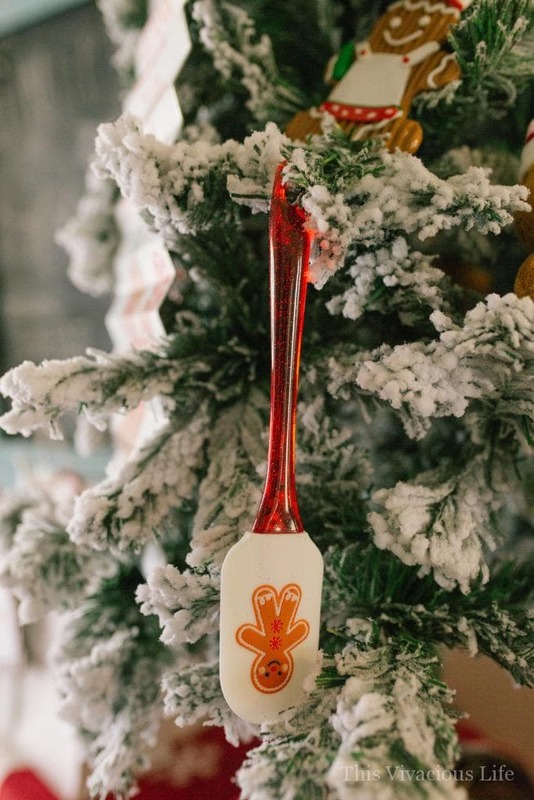 We included some spatulas and measuring spoons on the tree as well. A little chefs hat was the perfect topper for this sweet tree. 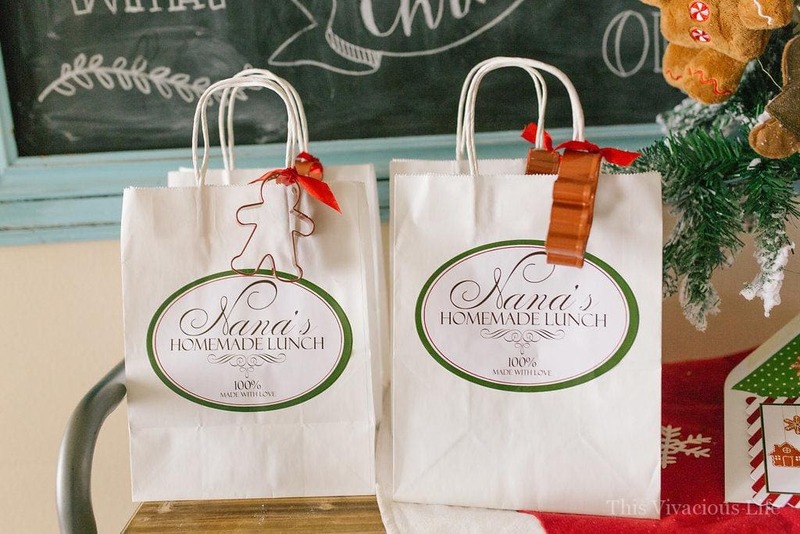 We put a beautiful red tree skirt under it and delicious little lunches for each child in white bags. 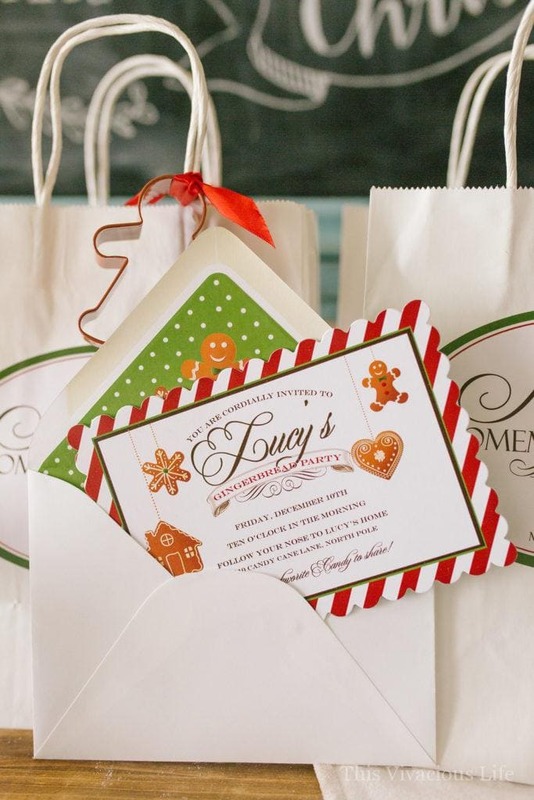 Each bag also had a gingerbread cookie cutter tied to it. The stickers on the front of each bag are from LoraleeLewis.com. 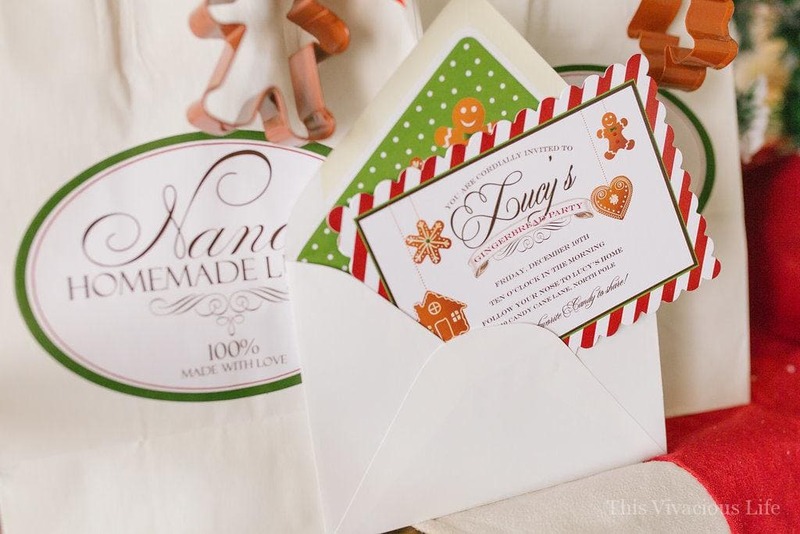 That is also where her darling invitations came from. I knew I just had to have them! After all, she did such a fantastic job on our witches night out Halloween party invitations. In the kitchen we had a big baking table with cake stands filled with treats. 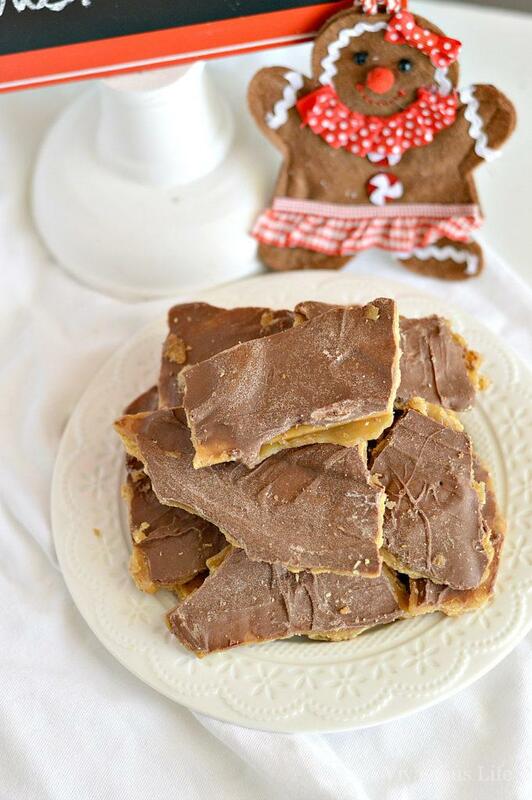 My favorite where the pieces of gluten-free Christmas crack we made using Glutino table crackers. 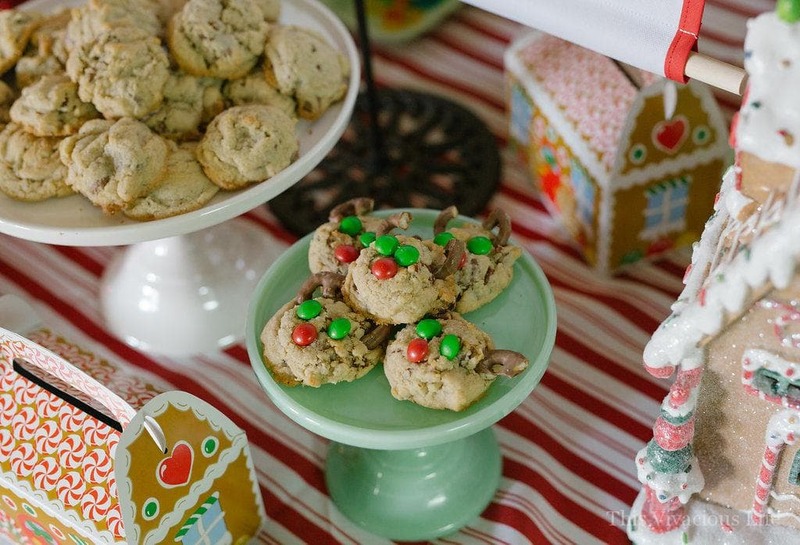 The little reindeer cookies were also yummy. There were vintage jadeite colored lunch trays. 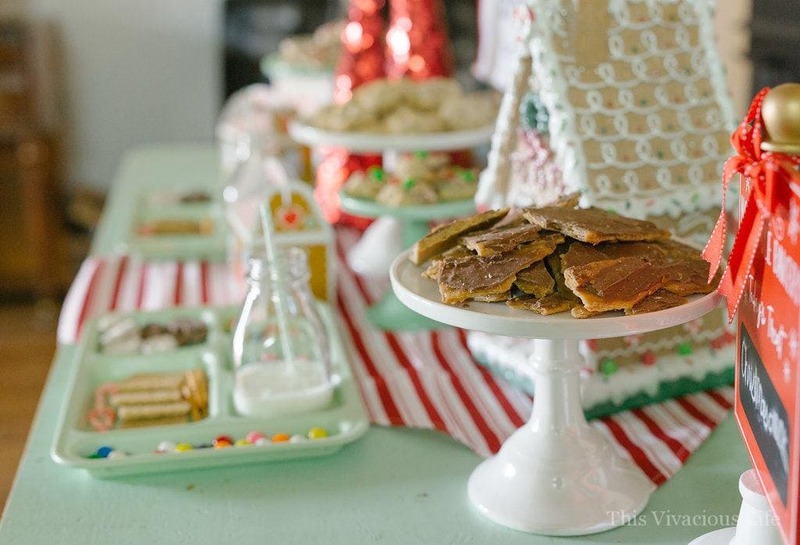 Each had all the fixings they needed to build their own little gluten-free graham cracker gingerbread houses. 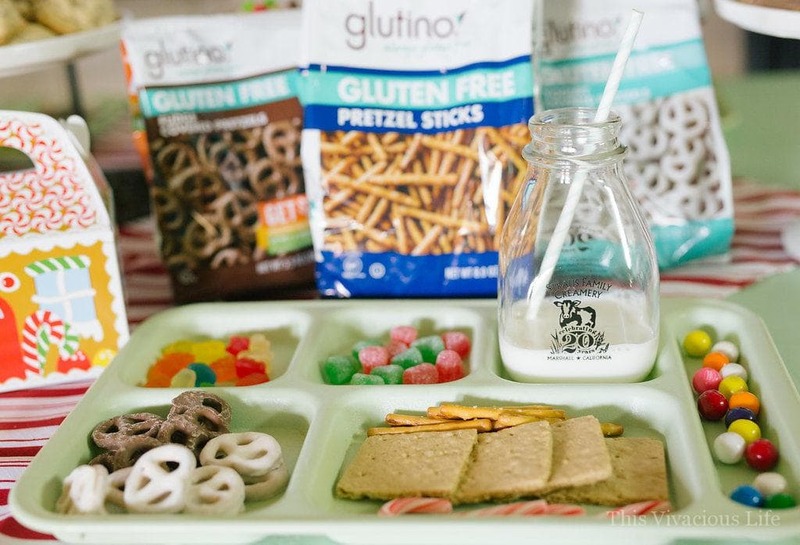 We made sure to include gum drops, little candy canes, gumballs, gummy bears and three different kinds of pretzels including rods, yogurt covered and fudge covered from Glutino. I also made sure to have vintage glass milk jugs on each tray so the kids could enjoy a cool drink when they got thirsty. 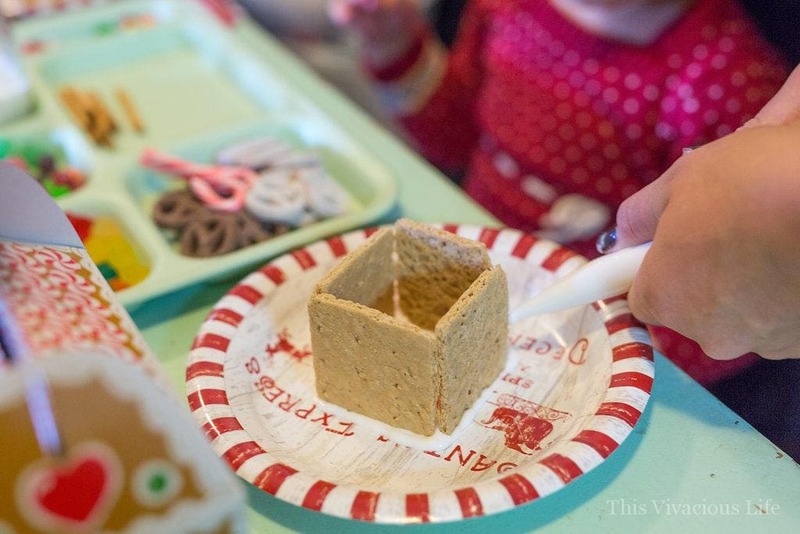 The little take-home cardboard gingerbread boxes were perfect for gathering sweets they couldn’t finish at the party. 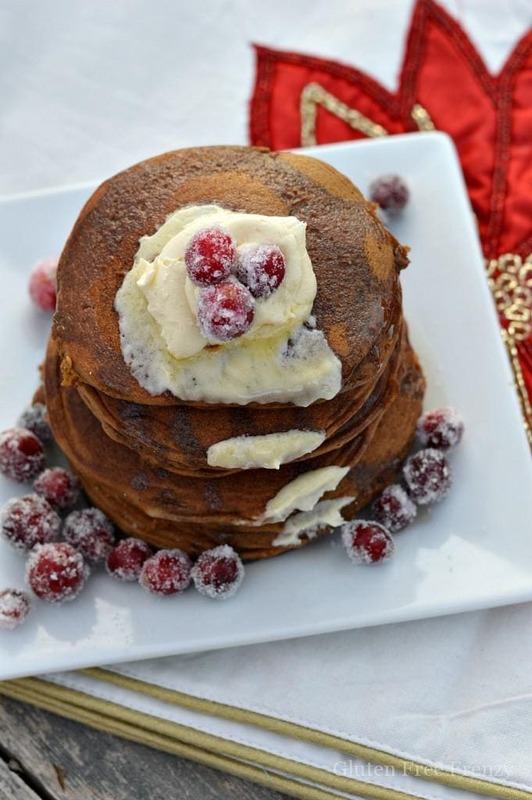 I thought about making our delicious gluten-free gingerbread pancakes or our gluten-free gingerbread men cookies but decided instead to keep it simple. Boy, am I glad I did. At 8 months pregnant, this was more than enough for me to put together. 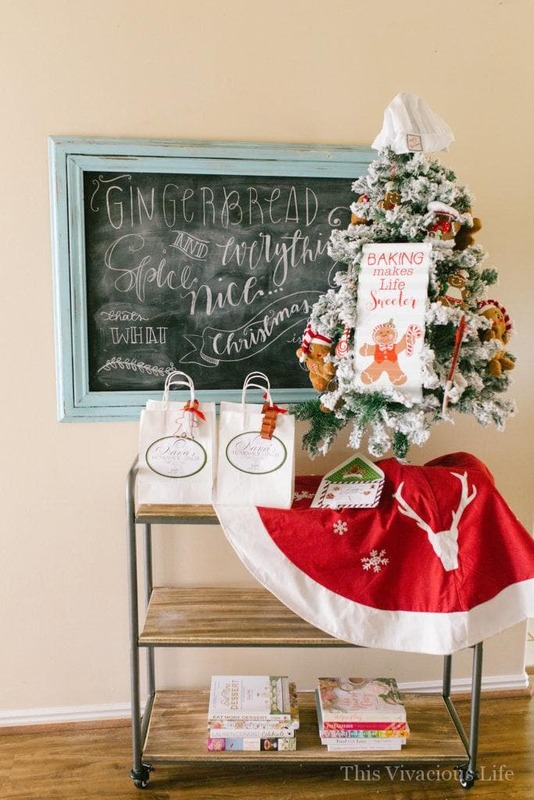 Red glitter trees and this darling gingerbread baking co sign from Grey Dot Co made the perfect table decor. 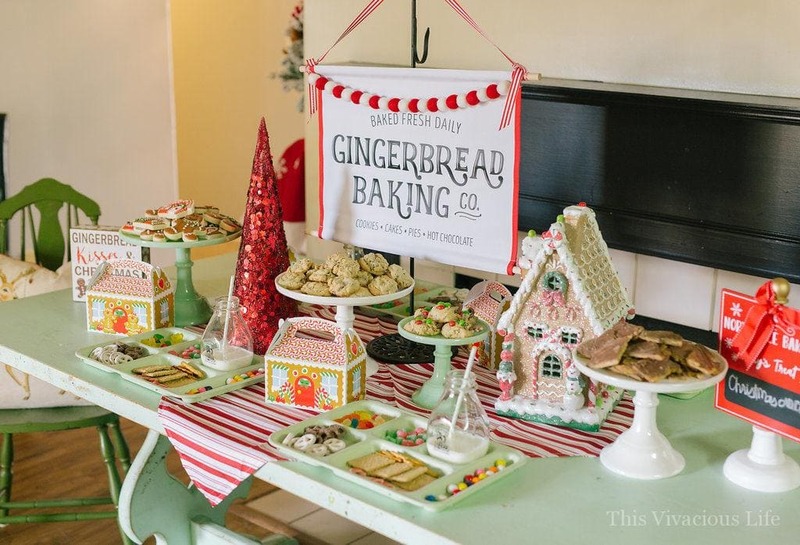 And of course what would a gingerbread decorating party be without some sort of big gingerbread house of the table right? We found this beautiful one from Hobby lobby and it made the perfect addition. Since we were celebrating little lady’s birthday I want to do some sort of cake but keep it with the theme of the party. 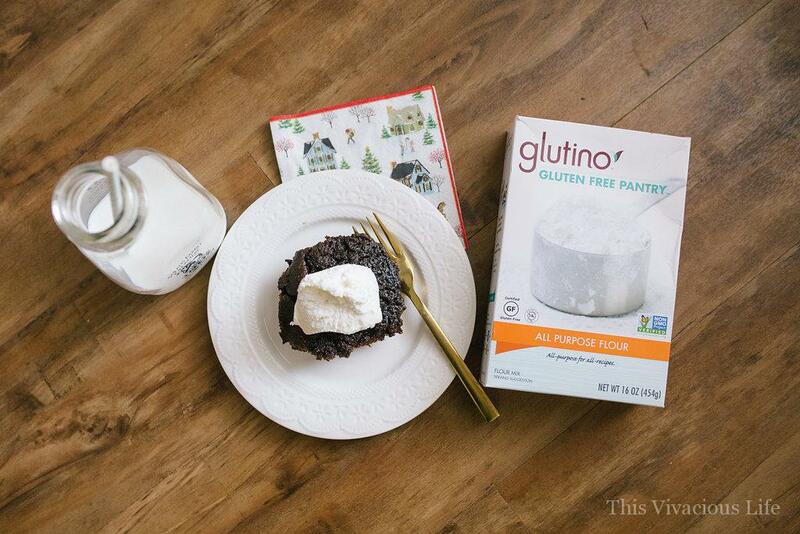 I decided on this gluten-free gingerbread pudding cake that can be made in a baking dish but is even better in a new Le Creuset pot. 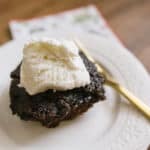 It turned out so ooey, gooey and full of rich molasses flavor. 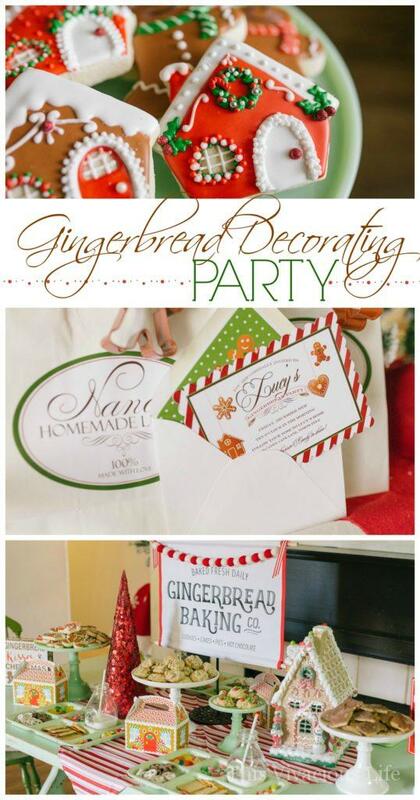 We hope you all have a very happy holiday and enjoy re-creating this party for your own family! 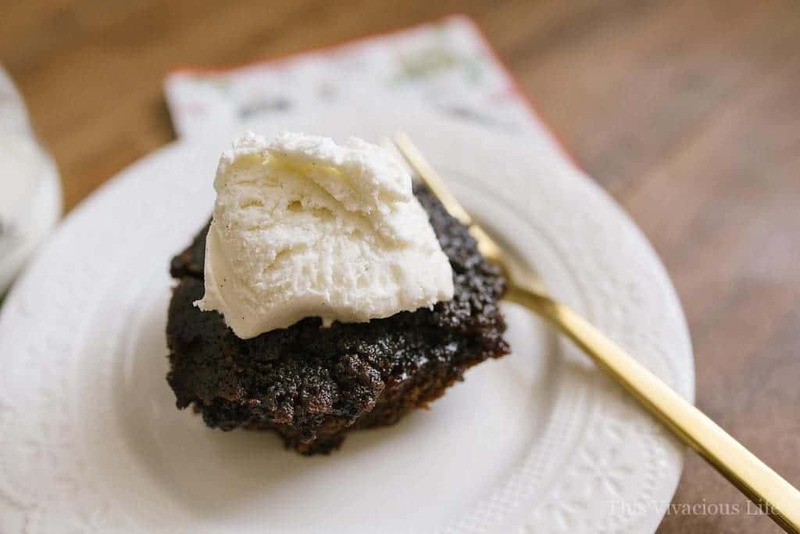 This pudding turns out so ooey, gooey and full of rich molasses flavor. It’s perfect made in a heavy bottom pan. 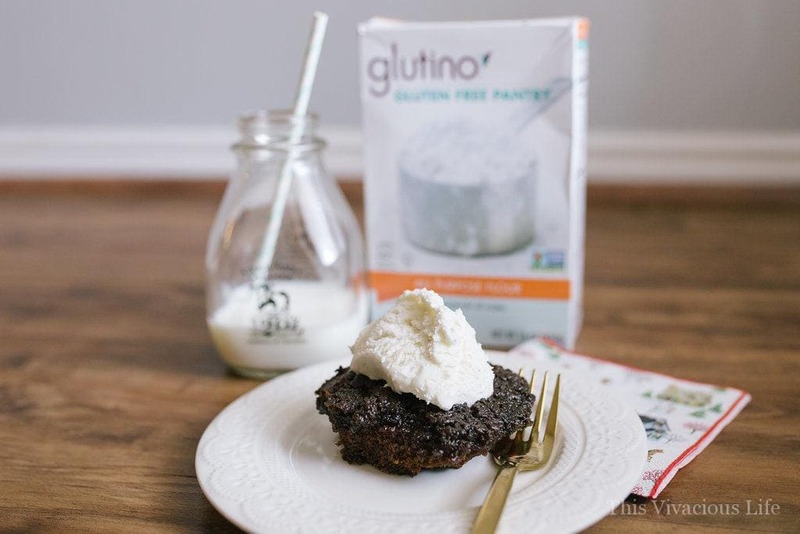 *Thank you to Glutino for sponsoring this post. I was provided with monetary and product compensation. All opinions are my own. I like get togethers where we exchange gifts and everyone brings a dish. We get together (the girls of the family) and make pierogies for Christmas Eve dinner. I look forward to it every year. 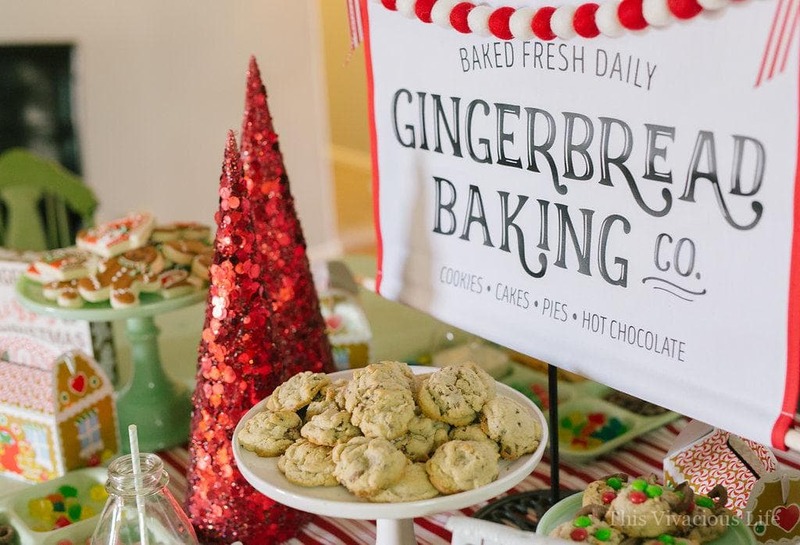 My favorite is a sugar cookie bar where the kids decorate their own cookies with frosting and toppings. An ornament decorating tree trimming party. 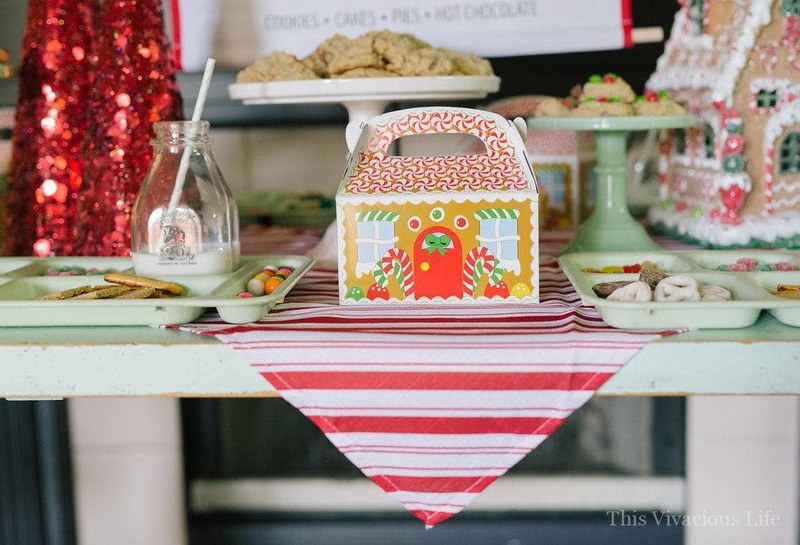 A cookie decorating party over a potluck luncheon is always fun! I love letting people decorate their own Christmas cookies at the party. My favorite holiday party idea is the ugly sweater one that sound like fun. 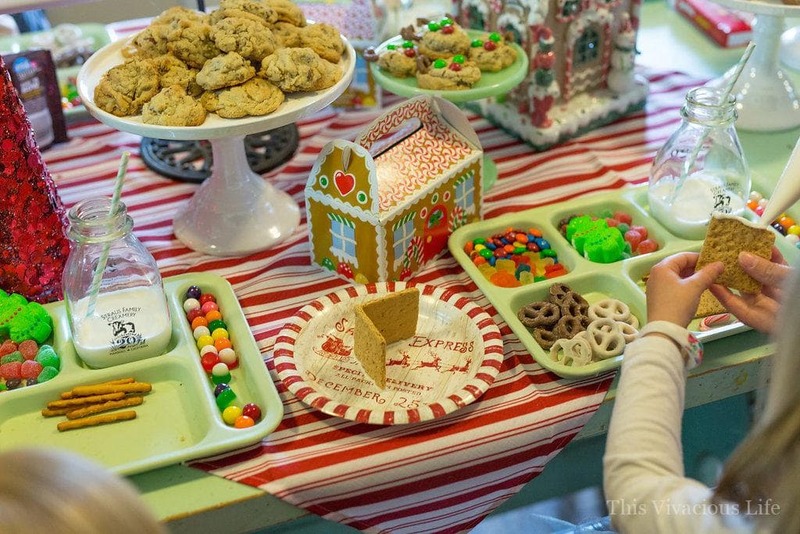 Elf on the shelf themed party! 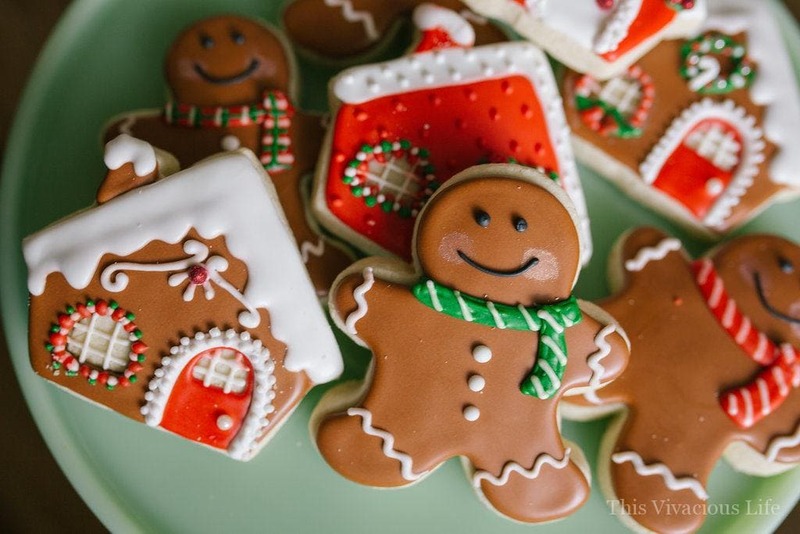 I like ideas that involve an activity – such as cookie decoration, or perhaps assembling bags with essentials to take to a homeless shelter or food bank. I love when everyone brings their favorite kind of cookies for others to try. 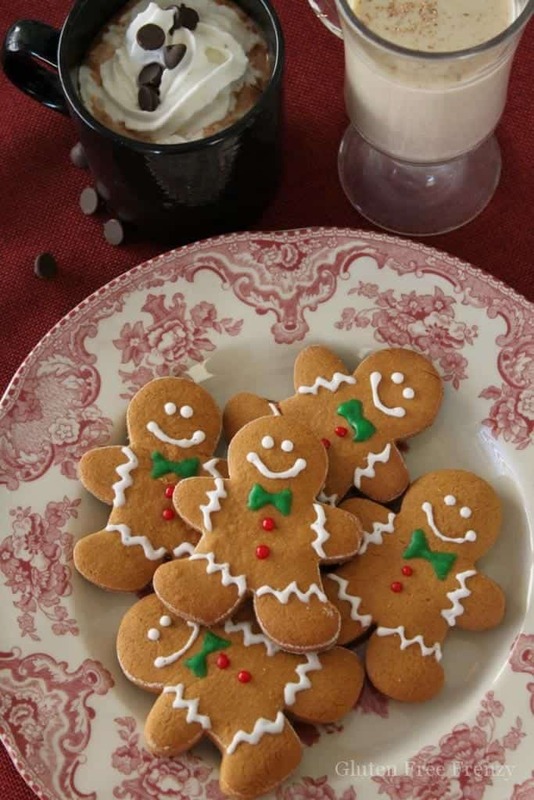 I love holiday cookie parties. So fun and so many good treats to discover. Potlucks with everyone sharing their favorite dishes!